Toneka Men's Casual Steampunk Studded Full grain Leather Link Belt - This belt can easily pull together your wardrobe with a brushed nickel single prong buckle and steampunk studded link accents through-out the belt. Sports an antique copper single prong buckle with two button snaps makes it easy to change the buckle depending on the occasion and match your wardrobe. Genuine full-grain leather with slight blemishes, wrinkle, texture, marks and color gradation adds to its unique characteristics. Solid full-grain leather rich texture makes it durable and resilient. The leather will age gracefully and become smoother and supple with time. 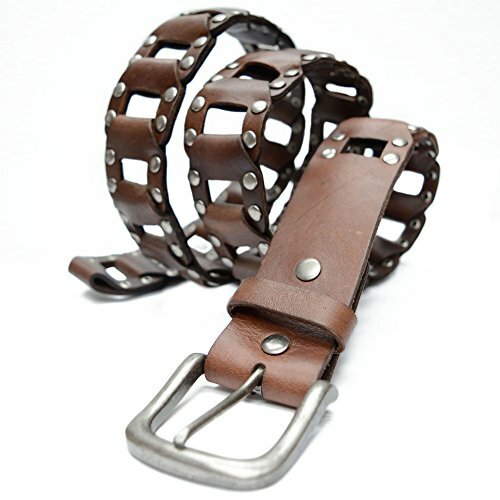 The belts are measured from the line between the buckle and the leather and the middle hole at the other end plus four inches to get the total strap length. Choosing the correct belt size: the belt size needs to be 3" larger than your waist size to give allowance for your outfit. If you have any questions about this product by Toneka, contact us by completing and submitting the form below. If you are looking for a specif part number, please include it with your message.